In 1837 the Waterbury firm of J.M.L. and W.H. Scovill, operated by brothers James and William Scovill, produced a series of copper tokens whose purpose was to satirize the economic policies of President Andrew Jackson and his successor Martin Van Buren. 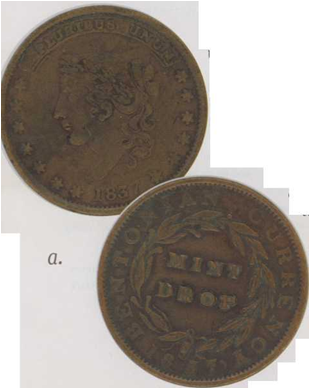 Manufactured in the midst of the Panic of 1837, the worst economic depression the United States had experienced, these tokens were nearly identical in size and weight to the large copper cents then being minted by the United States. They came to be accepted as legal tender as the depression deepened and gold, silver, and, eventually, copper coins disap¬peared from circulation due to bank failures and hoarding by the public. (2, Hard times token, J.M.L. & W.H. Scovill, 1837. The close approximation of this token to official United States coinage may have prompted the 1838 indictment of William H. Scovill for counterfeiting. h. Merchant’s token, J.M.L. & W.H. Scovill, 1837. The token advertises dry-goods pur­veyor Chamberlain Woodruff & Scranton of Fairhaven on one side and grocers Hotchkiss Hall & Platts on the other. C. Hard times token, J.M.L. & W.H. Scovill, 1837. “Shin plasters” was the satirical name given to the worthless paper money issued by many banks in the 1830s. d. Hard times token, J.M.L. & W.H. Scovill, 1841. Daniel Webster’s support for the Constitution and the United States Bank is depicted on one side, and the Van Buren administration’s continuation of what Whigs considered the dangerous financial “experiments” of Andrew Jackson is sati­rized on the reverse. These tokens are known to American numis¬matists and collectors as “hard times tokens.” That desig¬nation highlights their unintended use as currency but obscures their original intent as political satire and propaganda and their role as examples of the emerging prowess of the metalworking industry in the Waterbury area. National, state, and local politics in the 1830s and 1840s revolved around the back-and-forth struggle for power between Whigs and Democrats. The Whigs were the political heirs of the Federalists, while the Democrats had evolved from the Jeffersonian Republicans. Unalterably opposed to Andrew Jackson and his perceived tyranny and usurpation of power since his election in 1828, the former Federalists were compelled to re-brand themselves as “Whigs,” in emulation of earlier British politicians opposed to royal abuses of power, after his re-election in 1832. Between 1833 and 1855, Connecticut voters overwhelmingly supported Whig presidential candidates, while sending six Whigs and five Democrats to the United States Senate. In addition, six Whigs and six Democrats served as governor, and control of the legislature also changed hands frequently. The Whigs’ animosity toward Jackson centered on his economic policies, which they viewed as dangerous “experiments.” After his re-election, Jackson continued his attack upon the Second Bank of the United States, which was fueled by his mistrust of a centralized, private bank. In 1836 Jackson allowed the Bank’s charter to expire and ordered the withdrawal of U.S. government funds from its coffers. These funds were instead deposited with smaller, local banks, which, in turn, funded vastly increased levels of speculation in U.S. government land, notably in western states such as Michigan and Missouri. In July 1836, Jackson issued his “Specie Circular” stipulating that all purchases of government land were to be made in specie- gold and silver coinage—no: paper money or banknotes, which supporters of hard currency derisive¬ly referred to as “shin plasters,” This edict underwent the speculative boom, begun in the 1820s, that had been fueled by the overabundance of paper money issued by banks without enough gold or silver to back it up. Unfortunately for Martin Van Buren, elected president in 1836 and promising to continue Jackson’s economic policies. New York banks stopped all transactions using gold or silver on May 10, 1837, which led to the virtual disappearance of such coins from circulation. Over the next five years, economic conditions worsened. More than 600 banks failed, and unemploy¬ment reached unprecedented levels. Specie payments did not fully resume until 1842.
irother stood in for him but was unsuccessful in his election bid. In 1847 William was one of four delegates from Waterbury to the Whig party’s state convention. 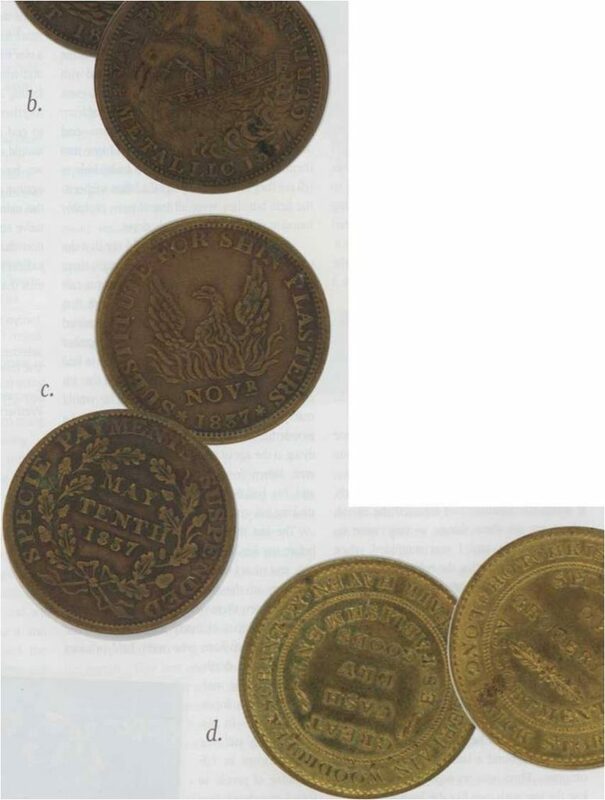 Current research identifies more than 600 varieties of hard times tokens, about half of which are positively identified as being made by 12 makers. Of these 12 makers, Scovill & Co. was the most prolific, producing 90 varieties. The high quality of the Scovill tokens is directly attributable to the skill of William Eaves, a die-cutter from Birmingham, England.